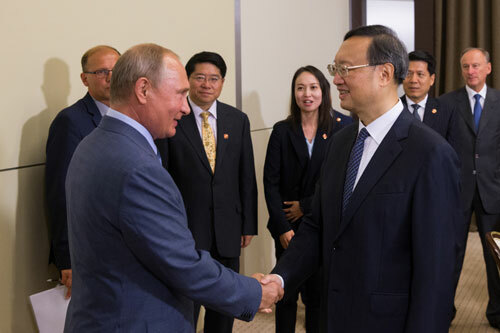 On August 15, 2018 local time, President Vladimir Putin of Russia met in Sochi with Member of the Political Bureau of the Central Committee of the Communist Party of China (CPC) and Director of the Office of the Foreign Affairs Commission of the CPC Central Committee Yang Jiechi. Vladimir Putin expressed that Russia-China relations have been marching forward in the direction set by both sides. Last month, President Xi Jinping and I exchanged in-depth views and reached new important consensus on the relations between the two countries and international situation on the sidelines of the BRICS Summit. Russia-China relations are of great importance to the two countries and the world at large. The Russian side is willing to, together with the Chinese side, further enhance strategic communication, promote bilateral comprehensive strategic partnership of coordination, deepen practical cooperation in various fields, and intensify coordination and cooperation in international and regional affairs. I look forward to meeting with President Xi Jinping again. Yang Jiechi noted that this year is of milestone significance in the development history of China-Russia relations. President Xi Jinping and Mr. President have met each other twice, charting the course for cooperation between the two countries in the next stage. Under the strategic guidance of President Xi Jinping and Mr. President, China-Russia comprehensive strategic partnership of coordination has maintained strong momentum, and set a model for promoting the building of a new type of international relations featuring mutual respect, fairness and justice, and win-win cooperation. 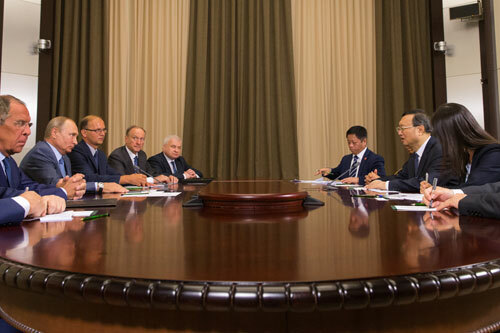 The Chinese side stands ready to, together with the Russian side, comprehensively implement the important consensus reached by the two heads of state, keep high-level strategic coordination, and promote the development of the international order in a more just and equitable direction, in a bid to open broader prospects for the development of China-Russia relations. On the same day, Yang Jiechi and Secretary of the National Security Council Nikolai Patrushev of Russia co-chaired the 14th round of China-Russia Strategic Security Consultation in Moscow. They exchanged in-depth views on China-Russia relations as well as international and regional issues of common concern and reached extensive consensus.